Neck pain medically termed as ‘cervical spondylosis‘, has become a common problem caused by the wear and tear of cartilage and bones in the cervical vertebra (neck) area. This degeneration of the bones and cartilage causes neck pain and can disrupt activities of daily living. Since this wear and tear happens with age, neck pain (cervical Spondylosis) is seen mostly in people above 50-60 years old. Now a day’s many young adults are suffering from neck pain because of the ‘sedentary epidemic’ use of computers, cell phones where you hold your neck stiff and look down and forward for extended periods of time, leading to repetitive stress on to the cervical spine. Lack of exercise can also cause neck pain. Even though age is a natural risk factor of the condition, it can also be triggered by many other factors. According to a study published in the Journal of Clinical Orthopedics and Trauma, It is found that gender and occupation form the other major risk factors for cervical spondylosis. Unless the risk factors are properly understood, it is difficult for the health care providers to give proper guidance to their patient community on preventive measures. One, with occupational trauma like gymnastics, professional dancing, carrying loads, etc. Patients, with some conditions like down syndrome, fused spine, cerebral palsy are at the greater risk of spondylosis. People with the family history of spondylosis. Holding the neck or sitting uncomfortable position for longer periods, such as during driving or watching TV for a long time. Sleeping in the sitting position, like during traveling. Pain increases with sitting, standing, tilting the neck backward, sneezing, and coughing, etc. Pain when you lift the arms. What can be done to help relieve neck pain? Non-steroidal anti-inflammatory drugs (NSAIDs) such as Ibuprofen (Motrin, Advil) and naproxen (Aleve) are staples in the treatment of neck pain or cervical spondylosis because they reduce both pain and inflammation. Physical therapy can help you to manage pain and improve your strength and flexibility. A physical therapist can provide a variety of treatments, help you understand your problem and get you back to your normal activities. 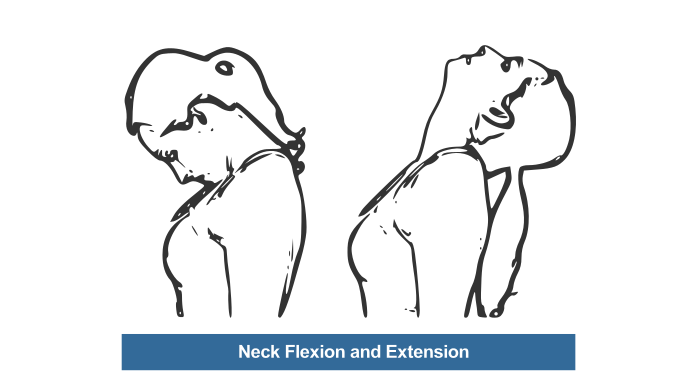 Improve your neck flexibility and health. If your neck pain lasts for a while, lack of movement can make your muscles weaken. This makes them re-occurrence in future. It is essential to that you do not rest too much and keep moving your neck. If you’re suffering from cervical spondylosis or neck pain, consult a doctor to find out the exact cause of your pain. You can consult your family physician or an orthopedist, spine specialist. Your doctor may also advise you on therapies to help relieve pain, such as postural changes, physical therapy, Pilates, or yoga. Also, your doctor may recommend analgesics or steroid injections. 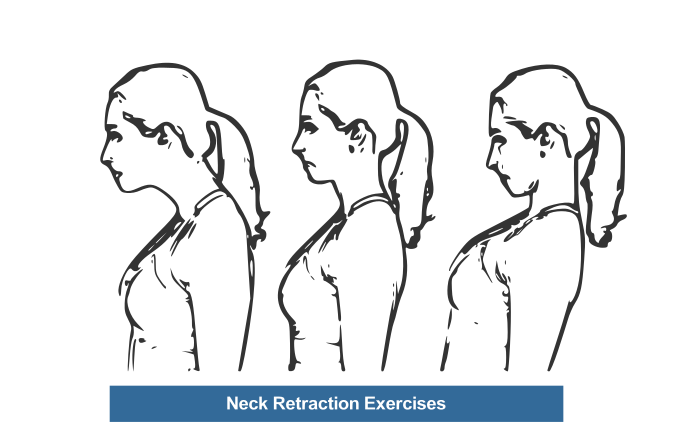 Here are a few Neck exercises for Cervical Spondylosis you can try for relieving neck pain or cervical spondylosis. Remember to move smoothly and gently through each exercise. 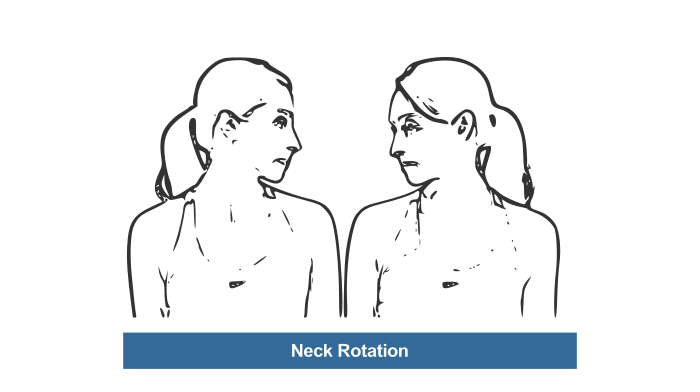 Twisting and turning your neck is done in the neck rotation exercise. Also, stop if any exercise or movement increases your neck pain. Never make any sudden movements or jerk your neck. You can do this exercise in both standing or sitting position. Slowly drop your head forward until your chin touches your chest. Maintain the position for five to ten sec. Then return to your starting position. Next, lean your head slightly back and hold this position for five to ten seconds. Repeat this exercise in each direction 5 times. You can do this exercise in standing or sitting posture. Slowly tilt your head toward your left shoulder while keeping your right shoulder down. Maintain this position for 5 to 10 sec, and then return your head to center. Repeat on the right side by tilting your head toward your right shoulder and holding your right shoulder down. Maintain this position for FIVE to TEN seconds. Repeat the whole sequence 5 times. This opposing motion works the sides of your neck. You can do this exercise in standing or sitting in a chair with good posture. Slowly turn your head to the right, keeping your chin Maintain this position for 5 to 10 sec, and then return to center. Slowly turn your head to the left and hold for 5 to 10 seconds. Then return to center. Repeat five times on each side. It is a good exercise for the sides of your neck. In severe cases, your doctor may suggest wearing cervical collars like Collar Soft – Firm Density to minimize further damage to neck muscles and to recover from the condition. Sit in a chair with your shoulders back and your head straight. Pull your chin straight in, like you are making a double chin. Maintain this position for FIVE to TEN seconds while feeling the stretch in your neck. Along with your neck, don’t neglect your shoulders. Exercising your shoulders will also strengthen the muscles that support your neck. You can do this exercise in both the sitting or standing posture. Then roll your shoulders up, back, and down in one smooth motion. Repeat this movement 5 Then reverse the movement, rolling your shoulders up, forward, and down 5 times. 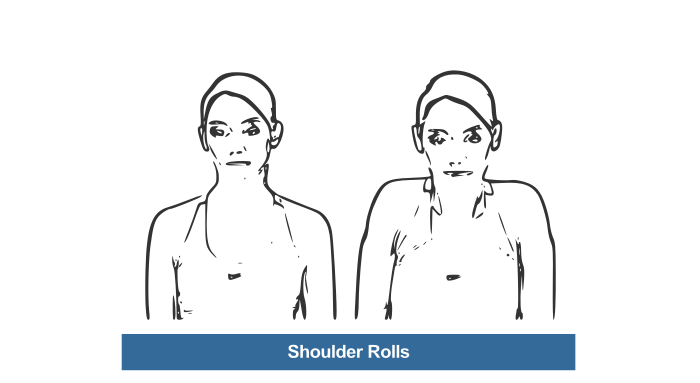 Shoulder rolls are a basic, easy exercise to keep your shoulder and neck joints fluid. 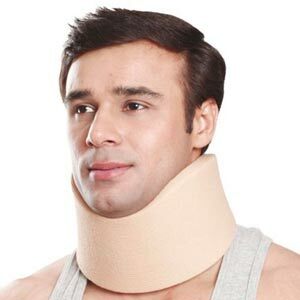 Use a firm cervical collar, if you are traveling for an extended period of time. 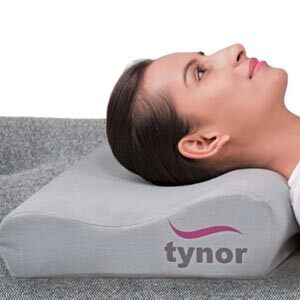 Cervical pillow allows the neck to be in hyperextended position and relaxes the neck muscles that generally get strained during the daytime activities. 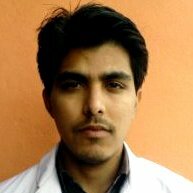 Dr. Kaleem Mohammed graduated as a Bachelor of Physiotherapy in 2014 from Deccan College of Physiotherapy, affiliated to Dr. N.T.R. University of Health Sciences, Vijayawada, India. Dr. Kaleem is an expert at handling physiotherapy needs of patients suffering from orthopedic and spinal conditions and post-surgery rehabilitation. Dr. Kaleem is associated with HealthClues since its inception where he facilitates diagnosis and advanced consultation with senior doctors. He is also a medical researcher and prolific writer who loves sharing insightful commentaries and useful tips to educate the patient community about fitness, treatment options, and post-treatment recovery. Cervical Spondylosis, Spine Surgery cervical collar, Cervical Pillow, Cervical Spondylosis, head tilt, neck exercises, neck exercises for cervical spondylosis, neck flexion, Neck pain, neck pain exercises, neck retraction, neck rotation, shoulder rolls. permalink. How to decide you need an ACL surgery?